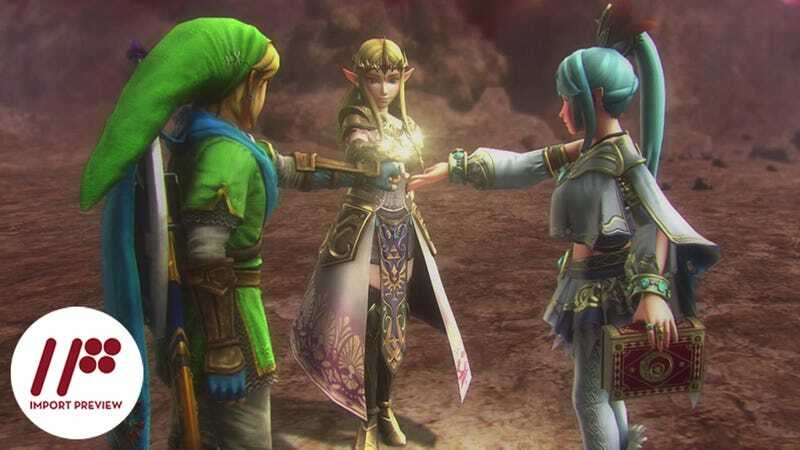 While the plot, setting, and characters may all be of Zelda lineage, make no mistake, when it comes to gameplay, this is a Dynasty Warriors game through and through. In the game's story mode, each battle begins with a simple main objective—usually something along the lines of killing the main enemy general or taking the enemy's main base. But once you get into battle, there is always something to stop you from achieving an easy victory—usually in the form of a locked door. But even after you’ve overcome that obstacle, there is always another on the horizon. Sometimes it’s another army showing up. Other times it’s an ambush springing up from areas you thought you cleared. Simply put, you will rarely be able to push straight for your objective. Instead you will be running back and forth across the field to where you are most needed—be that capturing areas, slaughtering enemies en masse, or fighting bosses. Thus, the game rarely feels boring even as you slog through wave upon wave of enemies while performing the same attacks again and again. You are always focused on completing your current task at the fastest possible speed while at the same time planning what your next move will be. Outside of the story mode is adventure mode. Adventure mode is built around unlocking areas of a Zelda NES-style map. Adventure mode lacks the dynamic battles of the story mode but instead focuses on short challenge levels. Some of these, though normal battles, require you to use a specific character or only want you to kill a certain amount of enemies in a given time limit. Others of these are a series of battle arenas where you have to show off your fighting skills against strong combinations of opponents. Some battles are even quiz battles where you have to kill the correct enemy to answer the room's question. Beating these challenges often rewards you with an item that can be used on the map itself to unlock especially useful prizes in another challenge level—like heart pieces or even new playable characters. All in all, it's a great little way of adding replay value after the story is completed. The other way that Hyrule Warriors incentivizes replay is with its loot, crafting, and level up systems. While your characters level up naturally and you find weapons in chests and on the corpses of enemies, these are not the only ways to make your characters more powerful. By gathering the loot from the bodies of more powerful enemies, you are able to craft items to boost your abilities in battle. These do everything from adding extra combos for use in your attack chains to boosting your elemental defense. You also gain a ton of rupees while fighting that can be used to level up a character instead of grinding exp for them in battle—something that comes in handy when the adventure mode forces you to play as a severely underleveled character. Hyrule Warriors has more than its fair share of awesome Zelda shout outs. These include everything from a hook shot with the moon from the Majora's Mask to bring it crashing down upon your enemies to Darunia's remastered and extended victory dance from Ocarina of Time. The story also sports a ton of familiar faces from Link, Zelda, and Ganondorf to Midna, Fi, and Ruto. However, make no mistake; this is not a Zelda game, despite it being drenched in Zelda elements. Like Dynasty Warriors Gundam before it, Hyrule Warriors is a Dynasty Warriors game when it comes down to the gameplay. You single-handedly destroy thousands of enemies per battle through various combos made by mixing your strong and weak attacks. You basically do one of four things when playing: fight bosses, take spawn points, take rooms, or just kill enemies by the score. When it comes down to it, that is the entire game. If you are expecting Zelda-esque dungeons and puzzles, you are looking in the wrong place. Frankly, Hyrule Warriors is quite a bare-bones example of a Dynasty Warriors game. It only has three modes: story, free (story without the story) and adventure. Moreover, there is no versus mode and coop is limited to local coop with one person playing on the game pad screen and the other on the TV. In fact, there is no online connectivity in the game at all. And that’s surprising as online play has been a staple of the series for years now. For the most part, Hyrule Warriors looks great. However, there is one area where the Wii U hardware fails to keep up: the number of enemies shown on screen. Nothing is more annoying than wading through a group of enemies—advancing slowly so as to kill them all in one pass—only to turn around and see dozens that were somehow missed. This happens whenever there are too many enemies in an area to all fit on the screen; so the game simply does not show them nor allow you to kill them. But the moment you deplete the visible population and are looking in another direction, the game spawns them in, acting like they were always there. Worse yet, if you are surrounded by a large force of allies—such as when you are trying to clear out one of your rooms that has been invaded—rendering said allies also prevents all the enemies from appearing on screen. And in a game where you are on a clock, madly rushing from place to place, wiping out as many enemies as efficiently as you can, not being able to see or attack all your foes in front of you is more than a little frustrating. If you like Zelda and Dynasty Warriors, this game is for you. If you like Dynasty Warriors, this game is for you. If you like Zelda but dislike (or have never played) Dynasty Warriors, you may want to avoid this game. When it comes down to it, Hyrule Warriors is Dynasty Warriors with a Zelda coat of paint and nothing more. If you are expecting anything like a 3D Zelda game, just know that this is completely different.